Posts tagged "convertible beach club deck"
34m award-winning power catamaran with as much interior space as a 40m monohull superyacht. Accommodates 12 guests in 6 cabins. €119,000/wk for up to 12 guests. We are pleased to inform you that Quaranta will be available this summer in the South of France and Adriatic! 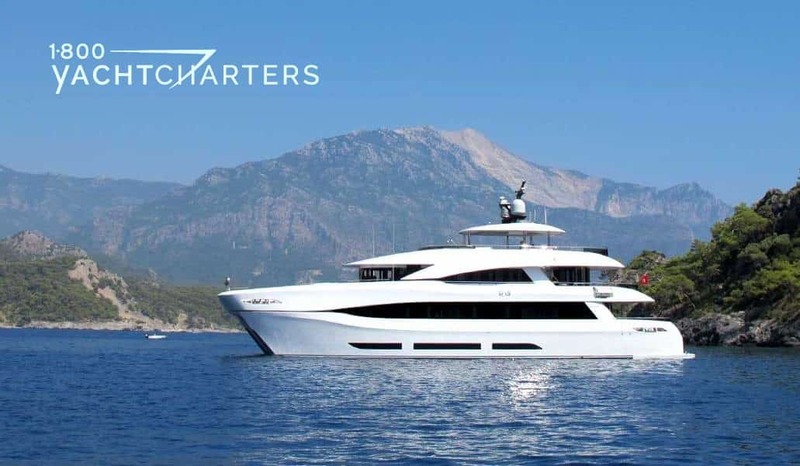 QUARANTA is the first motor yacht of the Curvelle Shipyard in Turkey. She is a winner of multiple prestigious design awards; although a 34m, 111′ superyacht catamaran, QUARANTA has as much interior and exterior volume as other performance monohulls in the 40m – 42m range. (Your clients) will appreciate the huge windows in every guest cabin and the flexibility of the stateroom layout configuration. All cabins can be rearranged and combined to a variety of different layouts to specifically cater to the client’s needs. Double cabins, twin cabins, triple cabins are all possible. In total, there are over 20 different layouts. Huge windows in each cabin. Romina knows we like to offer our clients superyachts with special features and great value. The number one request by our clients with large families – “Is there enough space for everyone to feel comfortable?” Yacht QUARANTA is the perfect alternative for these clients. With a 9 meter beam and 4 decks, private luxury yacht charter guests can about 50% more guest accommodation space than a comparable 30 meter monohull. The mid and upper decks are wide open, as is the large deck area on the Main Deck. This yacht is built for socializing! Our favorite onboard feature is the unique lowering platform that doubles as beach club deck. This platform can lower guests straight from the main deck and into the water. That’s so cool and unique!